Monday, December 7, 2015, 6:30 p.m. to 9 p.m.
Moving Bodies chronicles the brilliant life of Nobel Prize-winning scientist Richard Feynman. 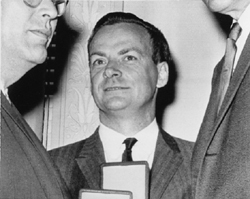 From his role in the development of the atomic bomb to his controversial testimony at the investigation of the Challenger disaster, Feynman casts a long shadow across the worlds of physics and mathematics. Through playwright Arthur Giron’s eyes, we see how Feynman became one of the most influential scientists of the 20th century. The performance runs 1.5 hours and includes a 15 minute intermission. It is followed by a post-show discussion with Kurt Elftmann, Arthur Giron, Rachael Murray, and JD Talasek. Giron is an educator and professional playwright. He was formerly head of the Graduate Playwriting Program at Carnegie Mellon University. His work was on Broadway last season, having co-written the book for the epic musical Amazing Grace. Giron's 15 plays are performed in the U.S. and abroad. Among them Emilie's Voltaire was awarded The Galileo Prize for dramas with science content. He is founder of Ensemble Studio Theater in New York, a theater dedicated to the development of new plays. He lives in New York City. The Alfred P. Sloan Foundation commissioned Moving Bodies.